With both dispensers, know that your safe effective deodorant is made with just three simple ingredients – aluminum-free sodium bicarbonate, tea tree oil and lavender oil. Extra-strength options are hard to come by with natural deodorant. Lifestinks' unmatched protection is a result of our high-quality oils. We harvest wisely and selectively within the melaleuca species to achieve increased anti-fungal and anti-bacterial properties. Lavender, when combined with tea tree, evokes a clean, vivid, fresh sensation. 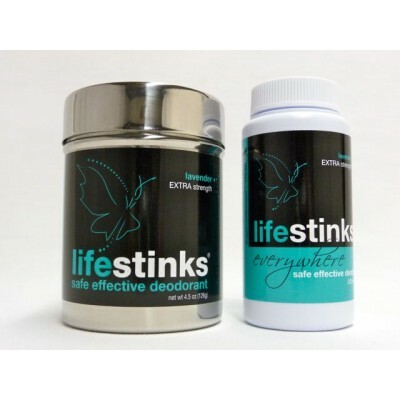 Like regular-strength lifestinks, our extra-strength deodorant provides gentle dryness while allowing for healthy perspiration.